Each week throughout the school year, the WIAA and Wendy's recognize varsity athletes, from each of the six classifications, who exhibited outstanding performances the previous week (based on nominations). The weekly deadline is the Tuesday before at 12:00 PM. 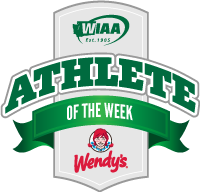 All varsity level students in good academic standing at their schools are eligible to receive the WIAA/Wendy's Athlete of the Week Award. Students may win the award once during any given academic year. Each winner receives a letter of recognition from the WIAA Executive Director, a commemorative WIAA/Wendy's Athlete of the Week promotional item, and a certificate. Winners are announced weekly on the WIAA website and on social media. USE THE TABS AT THE BOTTOM OF THE TABLE TO NAVIGATE TO PREVIOUS WEEKS WINNERS.